In writing of the history of Caliban and the Witch, Silvia Federici remarks: “my stay in Nigeria did not allow me to forget this work” – which is to say, the work that she and Leopoldina Fortunati had done for a previous book, Il Grande Calibano (1984). “I had buried my papers in the cellar, not expecting that I should need them for some time” (2004: 9). Yet in the midst of Structural Adjustment Programmes and the officially designated ‘War Against Indiscipline’ that were devastating the poor in much of the world, she felt that her work on Il Calibano “took on a new meaning”. Further along, Federici writes: “Today, these aspects of the transition to capitalism may seem (for Europe at least) things of the past – or as Marx put it in the Grundrisse – ‘historical preconditions’ of capitalist development, to be overcome by more mature forms of capitalism. But the essential similarity between these phenomena and the phase of globalisation that we are witnessing tells us otherwise” (2004: 82). The aspects of the transition Federici refers to are those processes that Marx situated under the heading of ‘primitive accumulation’. Simply put: for Marx, ‘primitive accumulation’ indicated the transition between feudalism and capitalism. Its most decisive elements included the enclosures of the commons, the clearing of the estates and the introduction of laws which ensured that those who might instead have gone roaming acquired the “discipline necessary for the wage system” through “laws grotesquely terrible” such as whipping, branding and torture (Marx, 1978: 688). In many respects, for classical Marxism the concept of ‘the transition’ is a theory of different forms of subjectivation. Specifically, it marks the threshold between subjection accomplished by violence and that distinguished by habituation, between a discipline brought about by the application of external force and the internalisation of control. In a political-economic register, that schema can be characterised as the transition between ‘bonded’ labour – legally and substantively fixed – and abstract labour, that is: the ostensible freedoms of the wage contract coupled with an indifference to the content of labours. To Marx’s account of the transition, Federici will add the terrors of the witch-hunts and anti-heresy campaigns that, in tandem with the rise of Rationalism, combined to produce the mechanisation of the body, the repression of women and the patriarchy of the wage. Caliban and the Witch includes a detailed study of the anti-feudal struggles of the European Middle Ages: the commons and the emergence of money-rent; heretics and the Inquisition, the Black Death and peasant armies. Federici diligently traces the connections between these and the witch-hunts which unleashed a campaign of terror against women, the ways in which “the female body – the uterus reduced to a machine for the reproduction of labor – [was consigned] into the hands of the state and the medical profession”, and the “transformation of sexual activity into work, a service to men, and procreation” (2004: 144, 192). 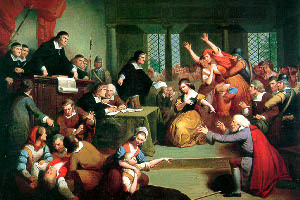 It concludes with a chapter on colonisation and Christianization in the ‘New World’, where the terror of the witch-hunts assumed a particularly vicious intensity in the subjugation of populations, but the course and methods of which also indicates the “global character of capitalist development” (2005:233). In one sense, and perhaps from the perspective of a cursory reading, what is at stake in Caliban and the Witch is the inclusion of women and the ‘Third World’ in the narrative of the transition as Marxism has, for the most part, understood it. Yet, this is no mere additive pluralism that would serve to merely widen the scope of the family portrait, give or take a few figures. That significant parts of the emerging proletariat gained a relative advantage through their – often active – complicity is discomforting of the idea of an essential harmony of interests that pluralism requires. Indeed, to the extent that Federici introduces the notion of “the patriarchy of the wage”, the very understanding of ‘the transition’ becomes reconceptualised as an enduring ‘transition’ and, thereby, hardly a transition at all. Because if the wage represents the reconfiguration of – ‘feudal’ – hierarchies as a quantitative difference of measure, the abiding distinction between paid and unpaid labour (as well as the racialised and gendered segmentations within the former) reminds us that the abstract indifference of capital grounds itself through the distinction between value and non-value. that had emerged from the anti-feudal struggle” (2004: 21, 24). At its narrative core, Caliban and the Witch is a story of an apocalypse. And, it is this sense of an apocalypse that refuses to stay buried in the cellar, as it were. It is why Caliban and the Witch makes sense, for us and in this time. It is a sense, moreover, that cannot be subdued by historicist assertions of an inevitable, if at times unfortunately waylaid, capitalist progress. As Walter Benjamin remarked in his ‘Theses on the Philosophy of History’, written in occupied Paris and under the shock of the pact between Hitler and Stalin: “To articulate the past historically does not mean to recognise it ‘the way it really was’, [as positivist historicism would have it]. It means to seize hold of a memory as it flashes up at a moment of danger” (1992: 247). For if Il Calibano took on a ‘new meaning’ in the context of, as Federici calls it, globalisation, Caliban and the Witch acquires for the reader the demanding intensity of a fable as the sense of the world segues from ‘globalisation’ to war. that such disputes arise, they turn not on the question of history as such – that is, history conceived as an abstract temporal schema whose ‘supreme virtue’, as Marx quipped, ‘is to be transhistorical’. On the contrary, those disputes revolve around the question of who ‘we’ are. As Jean-Luc Nancy has argued, history “does not belong primarily to time, nor to succession, nor to causality, but to community, or to being-in-common” (1993: 143). To put this another way: history – as it is written and written of, spoken and shared, and therefore performed – is always the demarcation of ‘our time’, whether this is premised on a distinction with that which is deemed, ‘for us’, to be past or, as here in Caliban and the Witch, on a continuity. According to Federici, Marx’s concept of ‘primitive accumulation’ does not characterise a past epoch, a time that has passed. For her, ‘primitive accumulation’ indicates “the past as something which survives into the present” (2004: 12). the “current amazement that the things we are experiencing are ‘still’ possible […] is not philosophical.” For Benjamin, thought – which is to say the possibility of thinking about the state of emergency that he confronted in 1940 – is immobilised by the idea of history as an inexorable and “triumphal progression”. “This amazement”, he wrote, “is not the beginning of knowledge – unless it is the knowledge that the view of history which gives rise to it is untenable” (1992: 249). So that thought might escape the apocalypse that Benjamin himself attempted to flee, the thought of history as a line of development must be relinquished. For Benjamin, that flight was tragically halted by border guards and, perhaps one should add, his own understandably desperate yet untimely resignation. The importance of Benjamin’s argument and experience is not simply his critique of a destinal conviction that, confronted with the terror of the state of emergency, was only capable of evincing stupefaction or acquiescence. Nor is it crucial to point out Benjamin’s idealism, which is more than apparent. What needs to be emphasised here is the phrase “we are experiencing”. A question, then, of sense – in every way it is possible to understand this word and beyond any separation between thought and matter. In that simple phrase rests the key to understanding how it becomes possible to characterise the current time, ‘our time’, as that of a global civil war – and how, in doing so, it might be possible to reconsider an exodus from it that is something other than the reterritorialising consolation of the ‘exit strategy’ for some. the transition to capitalism may seem (for Europe at least) things of the past” (2004:82). Where examples are presented of those aspects of “the past” which survive “into the present” (2004: 12, 239), they are almost invariably taken from Africa and Latin America. The exception is where mention is made of immigrant workers – which is to say, in the figure of those who come from ‘elsewhere’, the not-here, not of this time. In this way, geopolitical divisions are depicted as temporal ones, and the schema of history as linear succession remains intact, if uneasy. us’ – contained by the enclosures of the ‘Third World’. Today, that demarcation has become unstuck, mobile. This is due, most notably, to the unprecedented movements of people from ‘periphery’ to ‘core’ since the late 1960s. The return of ‘World War’ since 1989 marks the insufficiency of financialisation (and abstraction) to accomplishing the task of reasserting the differential, segmented markets that capitalism requires. And so, while Federici refuses to concede the mind-body distinction in her account of the witch-hunts, here it risks being read as a distinction between finance capital and landed property, where the latter appears in the guise of ostensibly pre-given national territories subdued by a globalising finance. But if ‘primitive accumulation’ consisted of a pact between capital and landed property against the rest of the world, that pact has not ceased to be effective. This is why the figures of the parable cannot be read as synonymous with the identities of women or people from the ‘Third World’, even if at times, and perhaps in the mode of an address, Federici makes it seem as if they might be. Yet Caliban is not Othello, the Witch is not the Princess – the enslaved and the persecuted do not belong to the community that belongs, in turn, to sovereignty. Federici concludes Caliban and the Witch by writing: “as soon as we strip the persecution of the witches from its metaphysical trappings, we recognise in it phenomena that are very close to home” (2004: 239). What might be added to this insight is that history is often one of the most captivating of the metaphysical trappings of ‘home’, of the habitus in which ‘we’ are said to reside. The state of emergency is not the exception which suddenly takes shape under the geopoliticised heading of ‘war has come home’; rather, it is the norm and the experience of the world, whose functioning is laid bare in moments of crisis. Benjamin, W. (1992) Illuminations, trans. H. Zohn. London: Fontana. Federici, S. and L. Fortunati (1984) Il Grande Calibano: Storia del Corpo Sociale Ribelle Neela Prima Fase del Capitale. Milan: Franco Angeli Editore. Federici, S. (2004) Caliban and the Witch. New York: Autonomedia. Keenan, T. (1997) Fables of Responsibility: Aberrations and Predicaments in Ethics and Politics. Marx, K. (1978) Capital: A Critique of Political Economy, Volume One. Moscow: Progress Press. Nancy, J-L. (1993) The Birth to Presence. California: Stanford University Press.